Best bets and value tips for racing from Kenilworth on Saturday 9th February with selections provided by Winning Form as well as their back page tipster, Magic Tips. TRIPPI'S EXPRESS has quickly returned to form and he stayed on strongly for 4th in stronger company despite finding traffic problems over this c & d early last month. He had CLIPPER CAPTAIN comfortably behind him that day but the Snaith inmate is better than some of his recent form and is fast reaching a competitive merit rating. The top weight VELVET DAWN found a strong finish for 3rd behind the smart Varsity Lover over this c & d earlier in the summer and she now has her peak effort in this lesser company. WINDOW TO AFRICA and RUN FOX RUN were both strongly fancied when the younger pairing cruised to respective debut victories over this c & d this summer and they do seem rather generously rated albeit at this early stage. 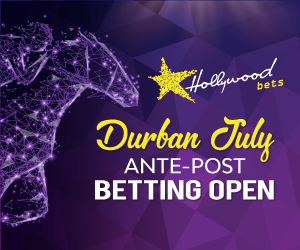 Get your free access to Winning Form South Africa by joining Hollywoodbets.net and clicking on Form Guide! The best racing guide in South Africa! Best bets and value tips for racing from the Vaal on Thursday 18th April with selections provided by Winning Form as well as their back page tipster, Magic Tips.